Starting at the Swan in Winterbourne, the walk passes through farmland and offers fine views of St Michael's Church before visiting the Monk's Pool and Bradley Brook nature reserves. Monks' Pool consists of four interconnecting ponds which were thought to have been built to supply fish for the nearby manor house. 3.5 miles. Start at The Swan,114 High St, Winterbourne. Turn Right out of pub car park and walk a short distance along High Street. Just before Tesco Petrol Station, turn Right along footpath between 2 high stone walls. At end, go over stile and follow RH side of field to go over stone stile. Turn Right and then go through kissing gate and Turn Left onto footpath. 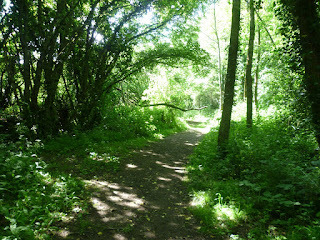 Follow this path and go straight on (wiggle to Right) at Ferndale Farm (lorries in yard). Continue a while but look for kissing gate on Left (near old metal farm gate across track – unless it’s open). Through kissing gate to follow footpath to right along field edge (good view of Church). Ignore wooden stile ahead and turn Left onto footpath (overgrown in summer). At end, go through kissing gate to turn Right onto track. Either take next Right or continue along track to see Church & Medieval Barn, before returning to go along the track (now on left). After a while, look for kissing gate on Left (opposite large metal farm gate). Go through kissing gate into Monk’s Pool Nature Reserve (info board). Follow path to left to go anti-clockwise round reserve; through woods to grass area. Go ahead over grass to see river before turning Right (wooden gateposts) along a grassy stretch to a kissing gate ahead. Through kissing gate and turn Left to go over bridge. Turn Right through another kissing gate into Bradley Brook Nature Reserve (info board & seat beside river). Follow path through woods, looking for bridge on Right. Go over bridge & through gate at far end. Go straight ahead (under pylon wires) to go through double set of small metal gates. Turn Left into field and follow trodden path round edge of field to wooden stile (can go round stile). Continue straight, re-tracing earlier steps, turning Right after kissing gate to go along track back to Ferndale Farm (lorries in yard). At farm, turn Left over stile into field (stile gets a bit overgrown). Straight across field, heading for footpath sign that is to the Left of building & communications mast). Exit field and Turn Right onto Swan Lane. After about 40 metres, Turn Left along track. Continue some way along this track (High Lane), going straight ahead at curve (see alternatives below), through gateway and past dwelling (on your left). Continue through another farm gateway and straight ahead through another farm gateway. Look for wooden stile on Right and go over this into field. Straight across field to climb another (high) stile and Turn Right onto a track and follow this. As track bends , go over stile (signed footpath) beside a metal farm gate on Right. Turn immediately Left to follow top edge of field. Look for a trough in wall on left and, just after trough, go through farm gate on left; Turn Right to follow wall along edge of field to go over a stile in corner of field. Go straight ahead on trodden path across field, toward cream houses. Exit field over stile and Turn Left into Swan Lane - The Swan pub is at end, on your Right. A. Continue to follow lane round curve to left; then fork Right. Fork Right again after bungalow with lorries. (Pass overgrown stile on R). Turn Right to follow track round to right (or cut across grass on trodden path), looking for stile on Left – which is point 21. B. (Shorter version in case it’s needed) At the curve, go through double metal farm gate on Right. Go almost straight ahead (with hedge on your Right) to go under pylons wires. At end, look slightly to Right for small gap in hedge ahead to go over a stile - beware step in gap before stile). Go straight ahead on trodden path across field, heading toward the right-hand tree of two trees – you will then see stile at point 23 – do not go over stile, but Turn Right to follow top of field to the trough in point 24. 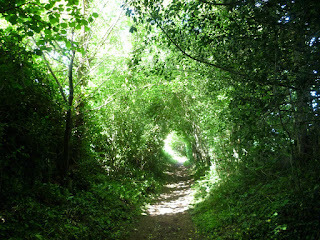 There and back – go as far as you wish and retrace steps, returning along Green Lane. Go Left out of pub. Turn immediately Left into Swan Lane (no pavement). Continue along Swan Lane, pass entrance to school and then Turn Left into Green Lane. Continue straight ahead beyond wooden stile ahead (can go round stile), where trodden path follows edge of field. Just past corner of field, go through double set of small metal gates. Straight ahead (under pylon wires) to go through another metal gate and over its bridge. Turn Left into Bradley Brook Nature Reserve. Follow the path as far as you wish (a kissing gate is at end) and then retrace your steps back to pub, via Green Lane and Swan Lane.